He’s not reliant on these sleights of hand; ‘The Black and Blue’ uses fingerpicked guitar and a smoky curl of pedal steel and ‘Bring You Back’ uses much the same set-up, this time with the pedal steel a more substantial presence, joined eventually by harmonica – it’s a wonderfully organic sound. ‘Thank You for the Good Things’ by contrast throws in everything: brass, taut strings, vibes and a dramatic vocal along with what sounds like bedsprings breaking. There’s something different at each turn, the low down flatulence of the tuba appearing again on ‘Bloodshot Eyes’, sounding like a corpulent uncle’s Christmas afternoon snores, whilst Johnson locates his sweetest hook. He finishes off with the raucous almost rockabilly of ‘Whale Song’ before returning to the guitar and pedal steel formula that suits him so well for the beautiful ‘These Days’. The record doesn’t have a transformative effect but listening to it should make you feel like you’re glad that you gave Johnson a chance. 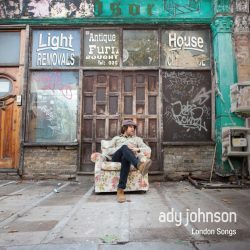 There’s plenty to like, and crucially he takes his influences and bends them into Ady Johnson.